Braddock’s March by Thomas E. Crocker | What Would The Founders Think? Thomas Crocker has written an important book. Braddock’s March is the story of how the defeat of a powerful army sowed the seeds of the American Revolution. It recounts the logistical nightmare of mounting a campaign across an ocean and deep into a dense and nearly impenetrable frontier. Braddock’s March fills in a lot of historical gaps in much the same way that Jeff Shaara’s Gone For Soldiers does. Both books provide an interesting look into the formative years of people who would find themselves on opposite sides of a conflict twenty years later. The French and Indian War was to the American Revolution what the Mexican American war was to the United States Civil war. In reading Crocker’s book, this reader was struck by many interesting facts, including the pivotal role that George Washington played, even early on, in the history of the United States. It was an impetuous and inexperienced George Washington who was responsible for creating an international incident that ignited the French and Indian War. Just as a flash in the pan of a Brown Bess preceded the ignition of a musket shot, a small incident in the wilderness ignited what was to become the epic struggle for control of a continent known in America as the French and Indian War and more broadly in Europe, as the Seven Years’ War. … Fortify the forks of the Ohio and destroy all persons who should impede their mission. 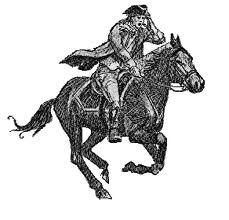 When Colonel Joshua Fry, the leader of the expedition, died as a result of injuries sustained in a fall from his horse, Washington assumed command. 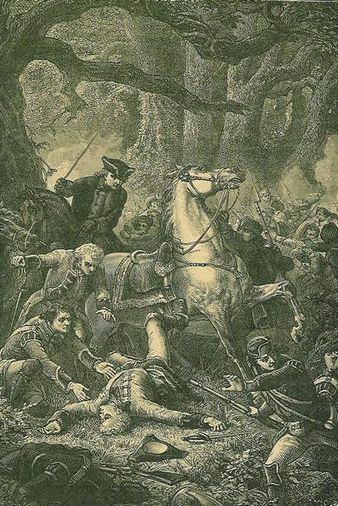 Washington and his Indian allies ambushed a small party of French, and killed ten of them. One of these was a young French nobleman named Jumonville. Washington apparently at a loss to control his Indian friends, watched in horror as their leader, a chief name the Half King, split open the Frenchman’s skull and washed his hands in the man’s brains. Although twenty-one French were made prisoner, at least one escaped and brought the story back to the French fort at the forks of the Ohio, in what is now Pittsburgh. Jumonville was the half-brother of a senior French officer at Fort Duquesne. He was mad and desirous of revenge. 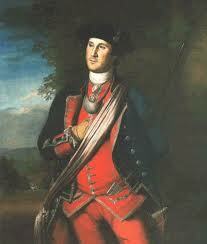 The garrison resolved to go after Washington and his Virginians. … to the Great Meadows, where, in two and half days, the Virginians constructed a crude circular palisaded fort with modest entrenchments that mounted seven swivel guns. At the center of the fort stood a small cabin which contained the powder and medicine chest of Dr. James Craik, the militia’s surgeon and Washington’s Alexandria neighbor, who, forty-five years later, was to bleed Washington on his deathbed. Miraculously, the French called for a parley and the American’s agreed. Washington negotiated the terms of Virginian’s surrender, but was somewhat hindered by not having a good idea what he was agreeing to, given his lack of a good interpreter. In the document of surrender, Washington, who spoke no French, acknowledged the “assassination” of Jumonville, an admission of culpability that placed the onus of culpability on Washington and caused a diplomatic row between London and Paris. In their haste to leave the next morning, Washington even forgot their colors, which the French took as a spoil of war. Thus, was the inauspicious beginning of Washington’s military career. He’d really messed things up, causing an international incident and shaming his troops to boot. But his part was not over. He would return again … and would fail again. But the next time, it wouldn’t be his fault, and he’d be hailed a hero. Braddock’s March is the story of a military disaster, and the forging of some of the major players in the American Revolution to take place twenty years later. It is also the story of many firsts. Among others, it was the first time Britain sent regular troops, in force to America. Upon their arrival Braddock convened the first successful pan-colonial conference in American history, the precursor to the Continental Congress that was to meet almost twenty years later. Indeed, the seeds of the issues that led to the later Congress were first sown at Braddock’s gathering of the five colonial governors. Aside from those colonial governors, Braddock’s American campaign involved a lot of other people who would later play significant roles in the new nation’s future, both for and against it. For many, service in the Braddock campaign was an astute career move. One summary of twenty noteworthy men who participated in Braddock’s march and the ensuing battle at the Monongahela found that “four had been at the Battle of Fort Necessity… eight were wounded at the Battle of the Monongahela… six were with General Forbes at the taking of Fort Duquesne … four four Quebec … six were intimately involved in Pontiac’s Conspiracy … eight became general officers in the American Revolution … one became commander in chief of the British forces … two were considered for the post of commander in chief of the revolutionary forces … four mad e major historical contributions through their writings .. one entered the U. S. Congress .. and one became the President of the United States. Washington was obviously the aforementioned President of the United States, but, in spite of his disastrous outing the previous year, he managed to join the expedition on his own terms. He wasn’t interested in staying with the general’s forces for duration. He wanted to join part way through and then leave as soon as there was a lull in the campaign. Washington had negotiated his way onto Braddock’s staff and had set the terms and conditions of his service. It was a remarkable achievement by a twenty-three-old colonial in dealing with a sixty-year-old major general with the disposition of an Iroquois. Braddock was a cantankerous, querulous general, who nonetheless had some good qualities of leadership that Washington later emulated. He also provided some stunning examples of what not to do, which Washington also took to heart. Crocker chronicles the long march to Fort Duquesne in detail, giving the reader a sense of the logistic hurdles involved. Braddock split his forces, using an advance group to hack a road through the forest and over several, not insignificant mountains. Even before setting out, he had to deal with uncooperative colonists, and ultimately took advantage of the services of a wily Benjamin Franklin to procure wagons for the long trek. In spite of the book’s title, Braddock’s actual march is probably the least interesting part of the story. However, the setup and background prior to the actual campaign and the battle itself were fascinating. In spite of being outnumbered and outgunned, the French and their Indian allies were able to surprise the British forces and achieve a decisive victory. Wikipedia sums up the carnage. The book culminates with great exposition of what the loss meant to the colonists, Britain, and the individual participants in the campaign. For the colonists, it meant an unrestrained reign of terror by the Indians. Within three months of Braddock’s defeat, the entire frontier was aflame with French and Indian attacks, which came to be known simply as “The Outrages”. Thousands of families abandoned their homes and farms and went back to the Piedmont and Tidewater, terrified. So severe the deprivations, that it was said that no English settlers would be left west of Virginia’s Blue Ridge. With Fort Cumberland all but abandoned, the new frontier line was drawn at Frederick, Maryland. Raids penetrated to within 100 miles of Philadelphia. Perhaps 1500 settlers were murdered and many more taken captive. According the one estimate, the frontier counties of three middle Atlantic colonies Virginia, Maryland, and Pennsylvania lost between a third and a half of their populations between 1755 and 1758, with some four percent of their prewar inhabitants murdered or captured. The French and their Indian allies killed civilians, women and children indiscriminately. They gloated at the sufferings of their victims. The impact on the psyche of Americans of the time was devastating. Moreover, there was a premeditation to the outrages that chilled the soul period one large raid in Pennsylvania consisted of 1400 Indians and French divided into scalping parties of 40 each. I week before, they had sent out numerous small scouting parties. The attack groups were targeted on carefully chosen settlements on the Pennsylvania frontier, such as Shamokin, Juniata, and Harris’s Ferry (today’s Harrisburg), until the whole frontier was blanketed. Each party thoroughly scouted its target for several days, and then all attacks were launched at the same time to achieve complete surprise. For the British, the disaster was the opening chapter in a war that would have far-reaching consequences. The Outrages in North America wouldn’t stop for another three years, when another English General would finally capture Fort Duquesne. For the main characters of the story, perhaps none benefited from their participation as much as did George Washington. Crocker points out six distinct influences on the Father of our Country. Leadership. Throughout his career, Washington adopted the hierarchical from of political and military leadership he learned from General Braddock. Washington became a lifelong fervent advocate of a regular, professional army. He remained forever skeptical of a volunteer militia. And while his experience in the American Revolution did nothing to disabuse him of his opinions, they were formed as a result of his service with militias both before and with Braddock’s campaign. Washington emulated Braddock’s style of aggressively taking the fight to the enemy. Washington, like Braddock, was a micro-manager. The details were important. However, Crocker points out a key difference in motivation. Washington was indefatigable in the service of the well-being of his soldiers and their cause, day in and day out. Nowhere was this more telling than at Valley Forge. As observed by one biographer, “no detail is too small.” He was rewarded with loyalty and affection. Washington also devoted significant time and effort to cultivating relations with the national and various state governments, which relations were on the whole good. He was rewarded with trust and supplies. Braddock also micromanaged but with far more mixed results. His management was not so much for the welfare of his soldiers as for the good of the expedition. He was rewarded with respect but not affection. His also devoted considerable and detailed attention to relations with the colonial governments, but the results were little short of disastrous. He was rewarded with acrimony and defaults. The leadership lessons that Washington learned were but one of the momentous consequences of Braddock’s disastrous march. This book provides terrific insights into the early motivations and causes of the American Revolution and the circumstances leading up to it. It’s a very good book.